Pediatric sedation dentistry can help your children endure difficult procedures and keep their fears of the dentist at bay. Laughing gas for kids, IV sedation and nitrous oxide conscious sedation are a few of the techniques your pediatric dentist in Brooklyn, NY has at his disposal. So whether you require a special needs pediatric dentistry, a children’s emergency dentist or just the best pediatric dentist in Brooklyn, you’ve found him at Family Cosmetic & Implants Dentistry of Brooklyn! There are two main kinds of sedation used by your pediatric dentist in Brooklyn: conscious and unconscious sedation. Conscious sedation is administered orally, intravenously or by inhalation. This form places your kids in a calm state so the procedure isn’t prolonged or complicated by agitation or squirming. A children’s dentist in Brooklyn understands that these first dental encounters may shape your children’s ideas of dentists for a lifetime. General anesthesia puts them completely under for the length of the procedure. There are instances when general anesthesia is required during a dental procedure, such as for an extraction or a lengthy root canal. Unconscious sedation isn’t often done, as these procedures aren’t always the best treatment options for children. When your child has an accident or a sports injury requiring an emergency dentist for kids, your nearest pediatric urgent care in Brooklyn is able to help. Your nearby office of pediatric dentistry of Brooklyn can safely use sedation on children for many of these emergency dental surgeries. Nitrous oxide conscious sedation. Nitrous oxide conscious sedation is the least invasive form of sedation. More commonly known as laughing gas for kids, it calms your child’s nerves about the procedure. A special needs pediatric dentist uses this form of sedation to keep your child calm too. Mild sedation. Typically used during procedures for older children and adults, this allows your child to remain calm while awake so they can follow your Brooklyn dentist’s instructions. Moderate sedation. This is a slightly deeper level of sedation, during which your child is sleepier than with mild sedation, but can still follow the instructions of the dentist. Memory loss of the procedure is common among most children when moderately sedated. IV sedation. In NYC pediatric sedation dentistry, IV sedation may become troublesome for children who are already afraid of the procedure when they learn they will have to deal with a needle at the same time. General anesthesia. This method of sedation is typically reserved for the most complicated procedures such as the removal of several teeth, impacted wisdom teeth or when your child is extremely worried about a procedure. Sedation dentistry greatly increases the speed of the procedure for your youngsters and for the dentist. Procedures that take hours in real time feel like they last minutes to kids after they wake up. The time required for more complex procedures that tend to need multiple visits is reduced, too, as your pediatric dentist in Brooklyn gets more time to work when he can use anesthesia on a child who can’t sit still. The benefit to your children is a calming effect. If they have extreme anxiety about a procedure, sedation helps them endure the visit and leave with no bad memories. Even after you’ve talked to them beforehand about what to expect, they may still be afraid. Sedation keeps them relaxed and completely unaware of what’s going on while the procedure is happening. You need to visit an experienced pediatric sedation dentistry professional because if sedation isn’t delivered in the correct dosage, serious and even fatal consequences can occur. 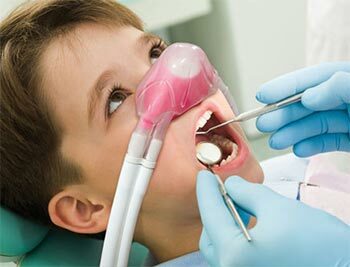 In the hands of an expert pediatric dentist, the use of laughing gas for kids and other sedatives is completely safe. The chances of over-sedation are minimal. Children are particularly at risk because of their anatomy. Having larger tonsils increases the chances of their airways being obstructed. Specifically, children under age six can more easily have their airways blocked. Your children’s dentist in Brooklyn knows this and always recommends safe methods of sedation. Sedation isn’t always required. You should ask questions to find out if it is required for your children’s procedure. Sometimes, a local anesthetic like Novocain is all that’s needed to make a procedure painless. Another alternative is using silver diamine fluoride, rubbed on decayed areas in your child’s mouth, to eliminate or reduce the chances of infection. The best pediatric dentist must have extensive experience, a caring approach and a passion for helping children keep those big, beautiful smiles. You’ll find that and more at Family Cosmetic & Implants Dentistry of Brooklyn, where the entire team is trained to calmly manage children of all ages and needs. Do you have any questions about the Sedation for Kids & Teens in Brooklyn? For more information or to schedule an appointment with the best pediatric dentist in Brooklyn Igor Khabensky DDS of Family Cosmetic & Implants Dentistry of Brooklyn? Please contact our pediatric dental for consultation with the kids dentist Igor Khabensky DDS.